Weddings and engagements are for celebrating your love for each other and yet so many people seem to get caught up in the stress of the wedding and lose sight of why they are getting married in the first place. If you are building the engagement ring together, this can give you some bonding time that you may have been missing out on lately. You can work together to create what will be a physical symbol of your eternal love. It is enjoyable and you will have the assistance of our experts. There is more than one method of building an engagement ring. You can browse through our large selection of diamond rings or you can present sketches to our specialists. This is primarily up to you and your imagination. If you are somewhat artistic and you do have some ideas in mind as far as the design of the engagement ring, you should consider taking an active part in the design process. This adds meaning to the piece and it will make her feel special knowing that you thought enough of her to do such a wonderful thing. 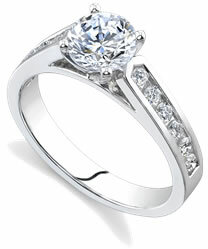 You can also check out our selection of diamond engagement rings and jewelry for ideas. This is a worthy idea because not only will you design the way you want the engagement ring to look, you will also have the opportunity to build an engagement ring yourself. This is the best way to devote your heart and soul into this important piece of jewelry. Can you imagine her face when she finds out that you took the time and effort to build her engagement ring? She will be touched at the thought and honored to wear this ring for her whole lifetime. No matter how you want to go about building the engagement ring you will have a choice between materials. Find out what she preferes and use these aspects design your own engagement ring. Does she like gold or platinum? Colored stones or diamonds? These are important questions and when you are trying to build her the perfect ring, these are some of the things you need to know. If this is a suprise then consider asking her mother or her best friend. Chances are they will have all of the answers that you seek. All you need to do is go forth and design your own engagement ring. One that will be cherished forever.